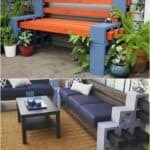 What about a resin wicker patio furniture set? The rays of the sun are just beginning to pierce, spring is the yearning for spring! The time has come for the great exterior cleaning and it will be time to bring out the garden furniture and clean it. But maybe it's time to change it too? For a few years now it is the braided resin wicker that has been growing in the garden, it decorates all balconies or terraces and you will understand why. The braided resin is a very resistant material and above all very design. Among all the possible variations, there will necessarily be one for you. 1001Gardens explains everything you need to know about braided rattan resin wicker furniture. How to recognize good quality braiding? Braids and colors in all their splendor! Even if the wicker rattan resin is a synthetic material, it can be confused with natural fibers This imitation can be modern or more traditional, which is why it adapts to all styles of decoration. Armchairs, tables, sofas, chairs, the resin is everywhere. This trendy and even chic material will enhance your terrace. The colors vary what is a little bit more to match the colors of your exterior (parasols, outdoor kitchen, or planter for example). The fabrics used for cushion, seat and back cushion covers are also available in a multitude of colors, from the soberest to the most colorful. The little extra is to add cushions to your garden furniture to reflect a more cozy and Mediterranean atmosphere. At the edge of your pool, the trend is truly braided resin. This still has a different effect than plastic and is more trendy than wood. Finally, comfort is an asset not to be neglected: remember to complete your installation with cushions and mattresses. The curves and colors of the wicker rattan resin garden furniture are attractive, they offer a certain conviviality, have a country and holiday spirit even on a balcony in the city center. The braided resin is close to wicker or rattan, warm materials. The braided resin also called "poly rattan" or wicker resin is made from polyethylene or PVC, molded in the form of fiber and then dyed. The fibers, which give this rattan or wicker appearance, are then braided around a metal structure, often made of aluminum. There are different types of braiding and different colors. The main quality of the resin is its resistance to weathering, UV rays, and strength. 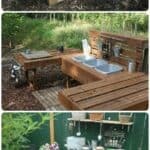 Despite the lightness of resin furniture, your garden furniture is not easily damaged and can withstand almost anything! Lightness has a positive effect: your garden furniture is very modular, you can change its layout with only two arms! No need to be several to transport it, and this according to your desires. Prices remain within everyone's reach because we count "top-of-the-range" resin or "bottom-of-the-range" resin. The latter offers furniture where the difference is not very apparent, but it feels long term in terms of product quality. In fact, garden furniture made of synthetic resin is less good quality and preserves the original color for less time. 3 Piece Set includes: 2 Swivel Gliding Chairs (Frame - 31" L x 30" W x 37" H, rocker cushions included), 1 Wicker End Table (Frame - 20" L x 20" W x 20" H, tempered glass top). 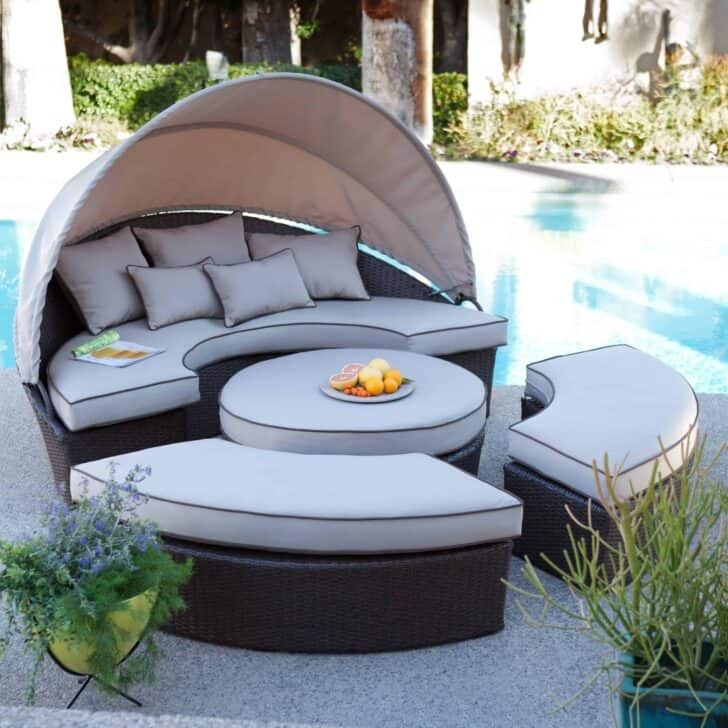 Designed for long lasting enjoyment indoors and out. All-weather resin wicker resistant to stains, cracks, water, UV rays. Durable powder coated steel frames. 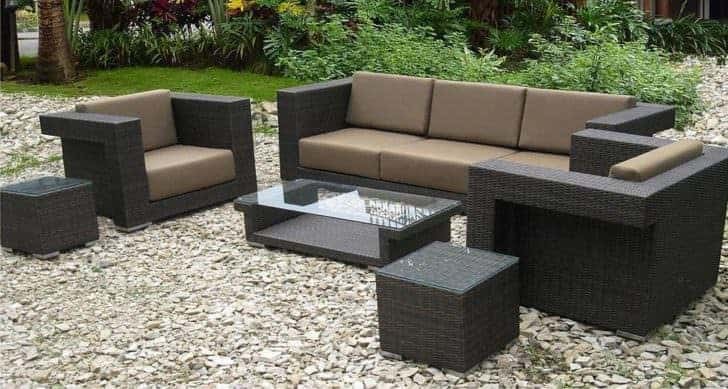 You can evaluate the quality of a rattan wicker patio furniture yourself at the time of purchase: if you can pass your finger under the braiding, this means that the braiding is too soft and therefore not very resistant, the resin is liable to deform in the long term. It is important that the braiding is tight and tight. First of all, check whether your product is guaranteed for a minimum of 12 months, as the braiding underneath may be of poor quality. Carefully read the specifications on the datasheet: if the product is hand-woven, strong and solid, and dyed in the mass (not just on the surface, which shows the raw color of the synthetic fiber in some places), the product is reliable. There are several types of wicker patio furniture of with resin, and especially several types of braiding: round braiding or flat braiding. The main difference lies in the visual aspect, however, it can be said that round braiding is stronger than flat braiding. The fibers are actually thicker, which gives a better quality to the product. The rendering looks more natural and this rattan resin is less likely to move over time. Maintenance is still the advantage not to be overlooked compared to a teak salon. It is simple and requires no special product. A soft sponge, a little soap, and warm water are enough. You can also use a soft bristle brush to remove dust or other residues. Finally, never attempt to clean your braided resin furniture with a solvent, bleach or chlorinated product as this is the best way to damage the quality of the material and the color. In winter, cover your furniture with a protective cover, it will be able to pass the bad season outside without problems. 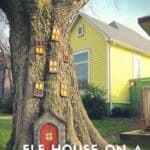 You just have to avoid handling it in cold weather because if the resin freezes, it may break and unfortunately, a braided resin piece of furniture is very difficult to repair.